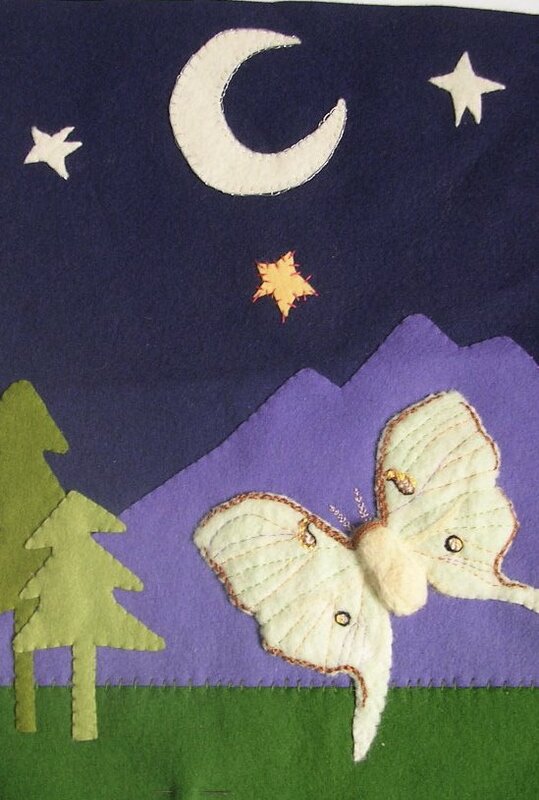 Inspired by Petra Berger's must-have book Felt Craft, I began this wallhanging for my son's room...in 2000. I planned to mount it in an open shadow box and make felt-decorated wooden figures that could play in the nighttime scene. I never got around to mounting the piece and the little figures were played with in other ways. Now my son is eight and his current interest in insects had me looking at the background in a new way when I came across it in my felt stash a week ago. I wet felted pale green roving using a bamboo sushi rolling mat and when the felt was dry, I needled it to a piece of off-white Holland felt. With Bruno's DK Butterflies and Moths field guide in hand, I used DMC Perle cotton and stranded floss to outline the wings. 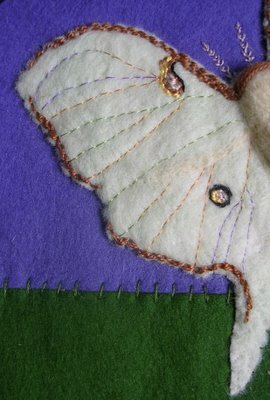 I needle felted the body between the wings and used multi-colored silk thread for the wing veins (that was the one bit of fantasia I was allowed by my son who wanted the moth to look realistic). I cut the moth out, stitched it in place and used a feather stitch to make the antennae. With two little buttonhole loops and two lightweight 3M Command adhesive hooks applied to the back, it's finally out of the UFO zone and on the wall. What a beautiful blog. I want to comment on every post! This butterfly is fantastic in every detail. I love the whole piece.